I love chocolate. But then, if you are following my ramblings you will have already guessed that. I also love trying new things. 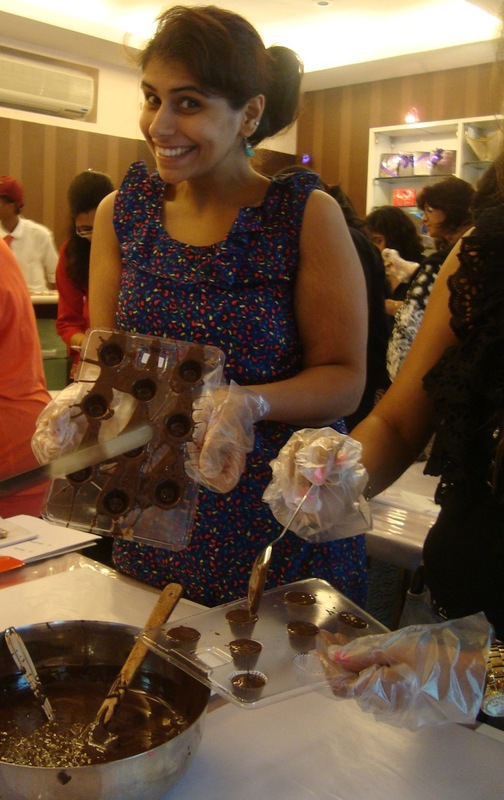 That’s why last weekend, I decided to go to a Chocolate Making Workshop organised by Comida Events and hosted by Zeba Kohli of Fantasie. It was a great experience where we learnt how to make truffles, shaded chocolates and lollipops – oh what an indulgence! But the best and most easiest thing I learnt was the Chocolate Rocks & Dipped Goodies and its a recipe I want to share with you all just because its so darn easy yet an opportunity for your inner creative genius to shine through so you can impress the Mr.
First, cover a baking tray with some butter paper for your goodies to rest. Now, melt some chocolate by double-boiling or in the microwave at 30 second blasts. For the Biscuits, take the biscuits and dip into the melted goodness. Remove onto your tray and decorate with muesli, marshmallows and jelly bits. For the Rocks, pour the remaining melted chocolate into a bowl with the almonds and raisins. Form round balls or a log. Once your creative genius is exhausted, stash the tray in the refrigerator to chill. When i make cookies they get stuck to the baking tray or sheet; whatever i use. And so i have to scratch the cookies, break them to take them out. Whats going wrong? That is indeed strange. Are you putting the cookies in the fridge to cool as soon as you are done with them? Try greasing the baking paper slightly or else you can use a silicon mat rather than baking paper. Nothing sticks to the silicon surface and it’s also reusable and hence more affordable. You will easily find it at Arife or even at nature’s basket. I never refrigerate cookies. But ya il definitely get the silicon mats and give it a try. Thank u soo much for ur suggestion.